An aid in the diagnosis and management of food allergies, to assist in the selection of appropriate foods for a dietary trial to rule out/diagnose adverse food reactions. IgG serology is included in addition to IgE as not all adverse food reactions (AFRs) are IgE-mediated, and the determination of anti-food IgG can be helpful here. Food screens are also available which provides simple positive/negative results which can then be expanded to get full results if required. Both the IgE and IgG SENSITEST serology tests have a high negative predictive value1, so ideally foods that are negative to both should be selected for a dietary trial, as highlighted in this example. IgE reactivity is classically associated with hypersensitivity, however the IgG data can be useful in cases of suspected adverse food reaction which are not IgE-mediated. 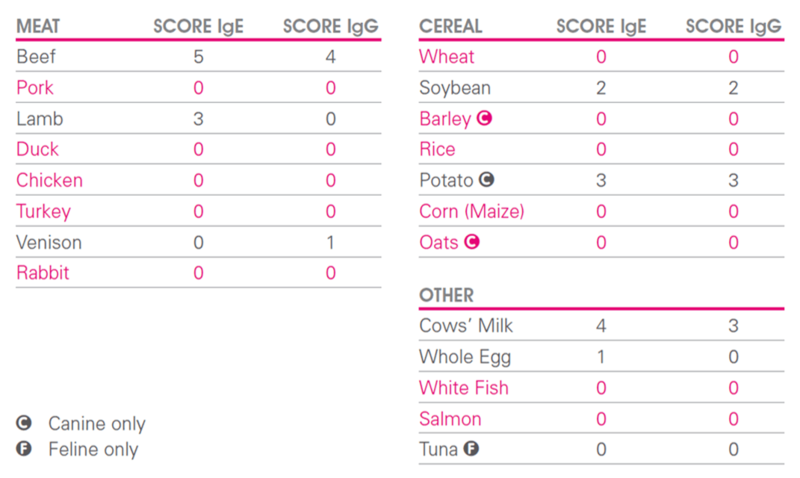 If the results yield no foods negative to both IgE and IgG, the foods with negative IgE scores and the lowest IgG reactivity should be selected for the exclusion diet or a hypoallergenic diet should be considered. Please see our canine veterinary diet database for help selecting the best commercial diet based on individual test results. There is increasing evidence that due to cross-reactivity between similar proteins, where possible it is also advisable to avoid foods derived from the same animal class. For example, in the results shown here, a hypersensitivity response is seen to mammalian proteins beef, lamb and milk and an IgG response is seen to venison. It would therefore be preferable to avoid other mammalian proteins such as pork and rabbit in this case and also avian proteins as hypersensitivity to egg is seen. Using a fish protein source for the exclusion diet would be the best choice for this dog if this fitted with the animals dietary history 2. The exclusion diet should be conducted for at least 8 weeks (or until a good clinical response is seen), then challenged with components of the original diet to identify relevant allergens and confirm the diagnosis of food allergy. Avacta Animal Health are proud to offer Cyno-Dial™ and Feli-Dial™; innovative, unique tests that assist in the selection of a veterinary prescribed diet for an elimination dietary trial. The next step after a SENSITEST® Food Allergy Test. Cyno/Feli-Dial™ uses a western blot technique to detect IgE-mediated reactions (hypersensitivities) against selected commercial diets alongside the animal’s existing diet. Sample proteins are extracted from the diet, separated on a gel according to their molecular weight and then transferred to a membrane (blot), which is then incubated in the presence of serum. When raised levels of antibodies against these proteins are present, they bind to the corresponding protein and a specific band appears on the membrane (see figure 1 below). WHICH VETERINARY PRESCRIBED DIETS DOES THE TEST ASSESS? For a comprehensive list of diets available, please contact our Technical Support team. Tests are run on a simple blood sample and are quick and easy to interpret. Within 15 days, you will receive precise recommendations on which diets are most likely to be tolerated by the animal and your results will clearly state which of the foods are ‘sensitised’ or ‘not sensitised’, therefore determining the most appropriate veterinary prescribed diet to favour during the elimination diet trial. Maintaining owner compliance during elimination dietary trials can be extremely challenging, which is why maximising the chances of selecting the most appropriate diet first time round is so important. The SENSITEST® Food Allergy Test and Cyno/Feli-Dial™ provide the perfect partnership to aid in the identification and management of food allergy. Alongside the animal’s own dietary history, specific problem foods can be highlighted enabling the selection of veterinary prescribed diets for a dietary trial and long-term management.